A GSM students string quartet constituted by Sharadram Sundaresan, 1st Violin, Hana Russell, 2nd Violin, Robin Wang, Viola and Janek Schaller, Cello, performed a full string quartet recital on Dec. 7th in Scoville Square, Oak Park. They played 60 minutes of uninterrupted beautiful music including baroque, classical and holiday music. 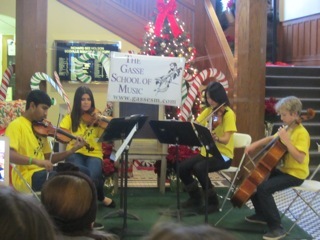 The GSM is proud of their musical rendition as well as their professional approach to the event. All of the members of this quartet started at GSM as private students, and progressed to the Chamber Music program after seen what other students groups were doing. They are a good example of what love for music, work, endurance and family support (all the ingredients of GSM teaching philosophy) can produce. The group is now at a level that allows them not only to enjoy making music and friendship, or play for their families or schools events, but also play for a paid gigue such as a wedding or a reception. See video of this string quartet.